Regardless of whether you’re thinking of adding a porch or a sunroom, it’s going to need a roof. The choice of roof is incredibly important, not just because it will have a big impact on the overall appearance of your space both inside and out, but because it also has an impact on the cost of your project. The big five considerations are: cost, room size, placement of existing windows, existing roof(s), and light. 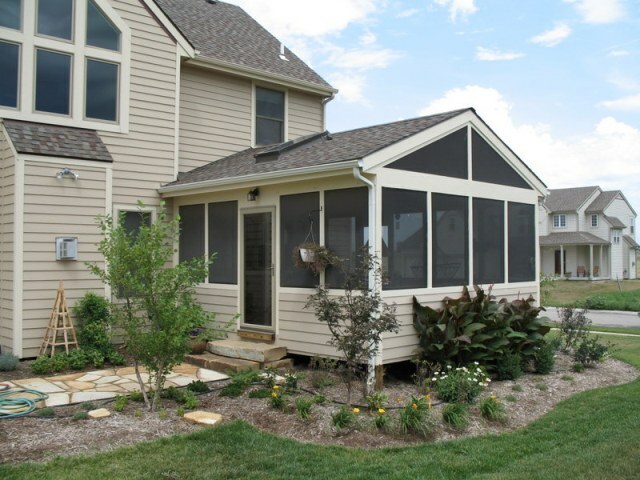 This screened porch has an open gable roof with a screened in gable. The most commonly chosen type of roof for a screened or open porch is the gable roof. Gable roofs can be constructed with an open, closed, glassed or screened gable at the end. This gives you maximum flexibility in terms of how much light and ventilation you can enjoy inside the space. The most frequent reason for not using a gable roof is that the window layout of the existing home won’t allow it. A hip roof that is attached to the house has a closed gable end. It is typically 3-sided but can have varying configurations. Hip roofs are very aesthetically appealing and they integrate beautifully into a home that already has a hip roof on another portion of the home. The downside? Hip roofs tend to require the most custom carpentry and are therefore the most expensive to build. This screened porch has a shed roof with a built in gable. A shed roof slopes in one direction away from the house. Shed roofs work especially well in situations where the porch is either very wide or very narrow because you don’t have to worry about the slope of the roof being too flat or peaked. They are also less expensive to construct. A shed roof also works well when there are many architectural elements on the second story that would be obstructed by a different roof style. We would be happy to discuss various roof design options in order to achieve your optimal balance of aesthetics, light, and cost. Perhaps you’d like to explore more unique options like a custom blended roof design that marries two different roof types. 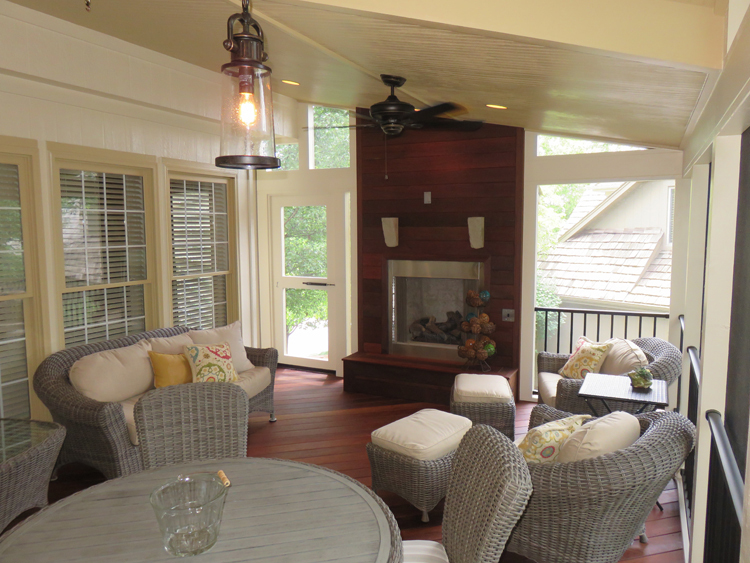 If you’re considering adding a sunroom, or screened porch or other roofed structure to your home, give us a ring. Our consultation is free. We can discuss options, provide design ideas and of course give you a price quote to consider. Give us a call or send us an email. Call (913) 851 – 3325, drop us an email at kansascity@archadeck.net or visit our website at kansas-city.archadeck.com. This entry was posted in porches on September 1, 2015 by archadeckkansascity.